← Engaging with KOL & KOI online – wake up pharma! I was asked by a twitter friend if I could provide some articles or examples of some of the things pharmaceutical companies are doing these days on social media. I thought why not do one better and just write a post about it? I am always using Boehringer Ingelheim as an example of best practice in social media and in my mind they still are a leader but other companies are also now doing great things in social media. So I had a little perusal on Facebook, Twitter and other channels and have pulled together some of my favourite, none Boehringer, examples from recent efforts. I though I would start with Pinterest which is one of my favourite pastimes when I am traveling and is often overlooked as a channel by pharma. I love Pinterest because it is so visual and I find it rather fun to post pictures quickly on my mobile while I sit on the bus. Pinterest also happens to be a great platform for driving traffic which I feel is something that pharma overlooks (and do not get me started on pharma and traffic driving failures!). 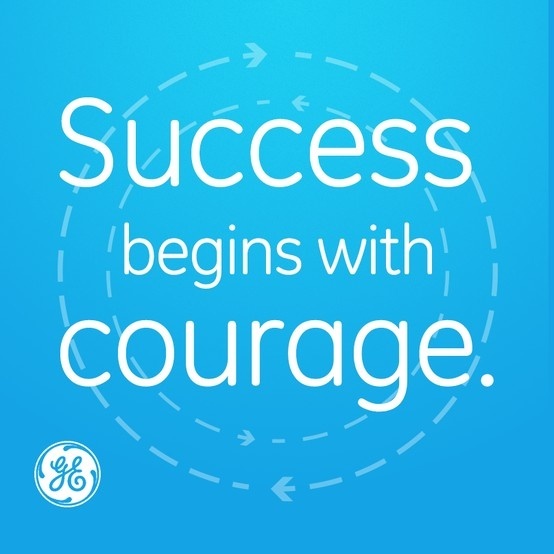 GE has a fantastic Pinterest board covering a range of subjects relating to the organisation. t GE Healthcare does not have an active account itself there are numerous boards within the GE account dedicated to healthcare. I personally find it interesting to see them in with other non-health boards – it is rather like browsing in a bookshop when you stumble upon something you were not looking for but find fascinating. Just like a bookstore GE’s Pinterest account is worth visiting because of the number of “books”, i.e. images, there is always something to find. Many pharma have very concentrated, small boards, so once you have visited you have pretty much seen it all. I also really like the GE pins as they are very much in line with the image GE is trying to convey and they are successfully integrated with their various campaigns like #GetFit. Many of the pins provide useful information and statistics around a disease but they also have a great board called Pinspire and one called Cancer Pintherapy which are full of inspirational content and quotes. Learning for other pharma: start being more active on Pinterest and share more of your visual content via this channel. 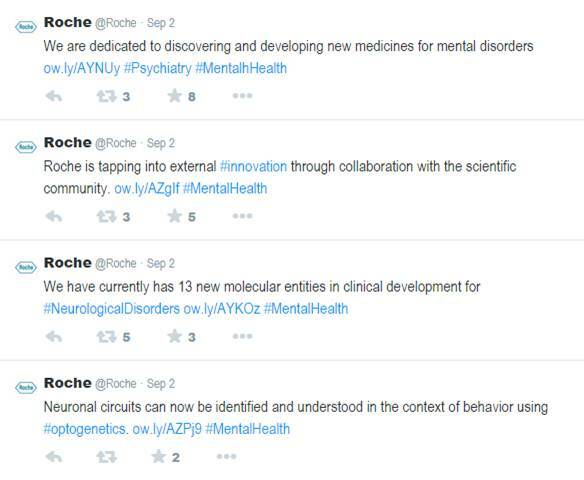 Whilst Roche may not be as engaging through their twitter feed as Boehringer is they do share interesting scientific content. 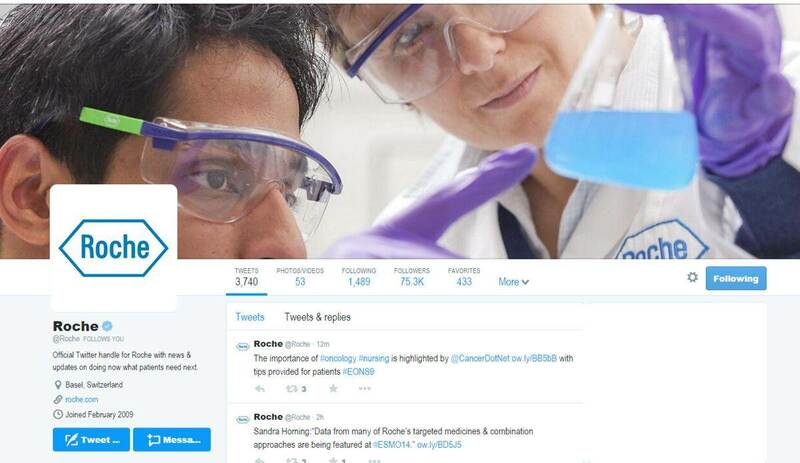 This reflects the company’s culture and focus on science and gives them a clear image on Twitter. There are tweets targeted at patients, for example linking through to their oncology Pinterest board, but for the most part their tweets are about the science. The whole look and feel of their Twitter account also reflects this with an image of scientists emblazoned across it. What I particularly like about their approach is that they are very clear in the purpose of their twitter feed and who they are targeting. This is a business account targeting scientists and medical professional first and foremost, followed by healthcare journalists and scientifically inclined patients. Despite this strong leaning towards the science they still manage to keep the tone of the tweets friendly and they do engage, responding to questions or tweets directed at them. Another noteworthy thing is the number of tweets – they are often tweeting multiple times a day and using relevant # which is great, in particular because this is still not always being done by some of their competitors. Learning for pharma: Be clear in who you are targeting via twitter and use frequency and # to ensure your target audience is seeing your tweets. Looking in the diabetes space on social media there are some great examples from pharma notably Novo Nordisk, Sanofi and Bayer Diabetes. As a whole I suggest to my pharma clients they should look in the diabetes space to see a vibrant active online community, where patients and caregivers are highly active and pharma are really engaging with some great content. As such it was a hard call but I decided to go for Bayer Diabetes as in my opinion their Facebook approach is just that bit more engaging and patient focused whilst at the same time targeting a global audience. It is also notable as its Facebook page is open to commenting, which is still not standard practice in pharma – Bayer is showing that they are open to engaging with people directly and are open to providing answers and resources in response to direct questions. 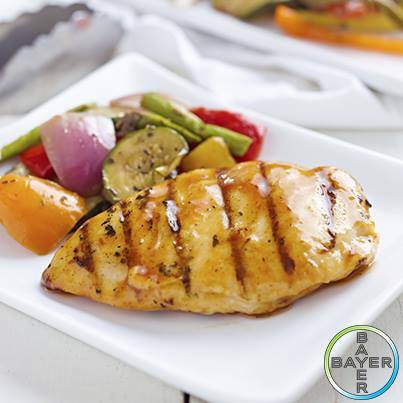 In fact relating to this another notable element to the Bayer Diabetes Facebook page is how they respond to questions. I have seen quite a few questions asking about content in different languages and Bayer has responded by developing more multi-lingual content (they currently cover Spanish, Russian, Portuguese and German as well as English). This to me is fantastic to see! Many pharma still spew out their social media and look like they are engaging but in reality they are not listening to their stakeholders needs and requests as they do not adapt or alter their content. Perhaps the other notable thing about these requests that Bayer Diabetes is getting is that it suggests diabetes patients are finding this information relevant and useful if they are proactively asking for it in other languages. I suspect this is because Diabetes Care is trying to do what they say they do – namely “helping to simplify the lives of people with diabetes, empowering them to take charge of their health and happiness”. Their content certainly is clearly focused on lifestyle tips (including recipes which were also requested by followers). They occasionally intersperse the content with disease awareness campaigns but for the most part the content has a clear purpose for a clear target – diabetes patients. These are just three nice examples from three of the platforms. When I have time I will provide my views on Linkedin, YouTube and Google+ but now I have to go back to doing some charity work and saving dogs’ lives in Romania. I would be interested to know your thoughts on your favourite pharma social media offerings and indeed GE, Roche and Bayer I would love to hear from you and hear your perspective on your efforts in this area. Posted on Sep 18, 2014, in Content, Facebook, Multichannel, Pinterest, Social Media, Twitter and tagged Facebook, Pinterst, social-media, Twitter. Bookmark the permalink. Leave a comment.